- 2, 3 and 4 Day vouchers are valid for 6 months from the date of purchase, and the ticket given in exchange is valid for 12 months. - 2, 3 & 4 Day tickets must be used within 7 days of the first day of use, but need not be on consecutive days. Live the magic for more than one day and enjoy Disneyland Paris Parks with Hopper Tickets ! 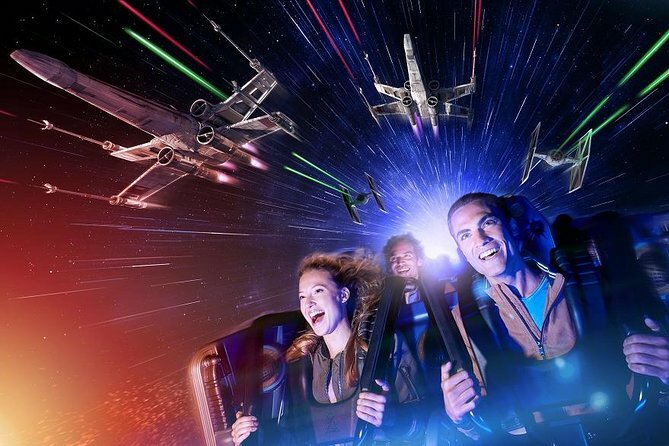 These tickets are a superb value, allowing admission to both Disneyland Park and Walt Disney Studios Park with the freedom to hop between both Disney Parks as often as you like for the duration of your choice. • Hopper Ticket 4 Day - 2 ParkSee the Itinerary section below for more details on each theme park. Disneyland® Park and Walt Disney Studios® Park opening hours are subject to change. Please consult the Disneyland® Paris website www.disneylandparis.com for the updated operating hours. A convenient and time saving way to purchase Disney tickets. Great!! Didn't have any problem with the voucher when I got to the parks. Good day, confusing on where we had to check in with our tickets as they're not regular tickets and had to exchange them for tickets which cause a bit of a delay in entrance. But it got sorted and an overall fantastic day at Disney! Excelente. Very easy to use and no lines. What can you say about Disney at Christmas time ... magnificent! This was our 11th time at Disneyland Paris but 1st time in November... Every family should live that at least once! Warmly recommended. Definitely worth getting your ticket organised early. Another time we went to the venue and bought the ticket there and it cost more than getting it via this site. Only problem was we did still have to line up when we got to the entrance to swap out paper voucher for an actual ticket before going inside. Disneyland was great when we finally got in!! We chose these tickets as thought it would be straight forward as we were travelling with our autistic daughter we needed things to go smoothley it was a disaster arrived at park entrance tried to scan our voucher codes to exchange for tickets and they wouldnt scan! we were told then to go to the ticket booth where someone would do it for us this didnt work either they tried a few times, at this point my daughter and the rest of the family were very stressed, we were then directed to guest services by disney hotel I waited in a huge que and finally after a long wait was seen then waited for another half an hour while they tried to make sense of what was the problem. I still dont know, but as we had printed out vouchers correctly disneyland staff said soI can only assume this is a common problem by the time we got into the park my daughter was in a terrible state and took ages to calm down, very distressing and disapointing.